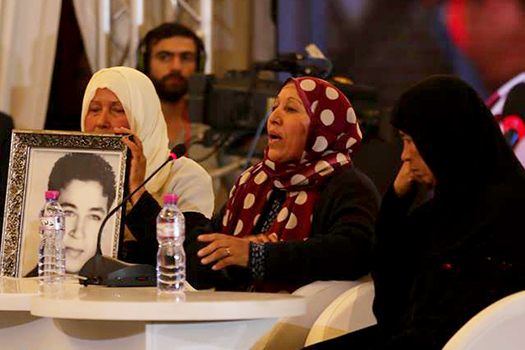 On a balmy evening last November, three mothers took their seats before Tunisia’s Truth and Dignity Commission (TDC), framed photos of their sons nestled in their arms. Their boys had been killed five years earlier during the Yasmine Revolution, a popular uprising that ended the dictatorship of Zine El Abidine Ben Ali in 2011. As the three women prepared to testify before the TDC, they gathered at the front of an elegant room, which was once part of an exclusive club for the dictator’s wife and their cronies. In the hours to follow, the building’s history – and indeed Tunisia’s future – would be rewritten by the mothers’ stories. Theirs were stories of loss; of suffering and of a thirst for justice. But embedded within them were the women’s hopes, their willingness to forgive, their dream of unity, and the enduring legacy of their sons. As the testimony progressed, the number of viewers held in rapt attention climbed ever higher- they crowded into the room, they huddled around television sets, and they streamed the proceedings to their devices by the tens of thousands. The impact was seismic, says Ibtihel Abdellatif, one of the TDC commissioners. “It was an earthquake for the country. Not an earthquake that destroys, but an earthquake that builds.” Such can be the power of public hearings. To address the legacy of massive human rights abuses and uncover the truth about the painful past, some countries have resorted to non-judicial mechanisms like truth commissions. Through investigations, testimony gathering, and archive research, these bodies have played a key role in establishing an official record about the past in countries ravaged by repression and conflict from Argentina to South Africa, from Morocco to Canada. Through their focus on the testimony of victims of atrocity, truth commissions provide acknowledgement and recognition of suffering and survival to those most affected. On the International Day for the Right to Truth we spotlight one of the most powerful ways truth commissions can reassert victims' dignity: public hearings. These open events can have a potentially cathartic power for victims and their families, but also the public at large by generating solidarity and empathy for the suffering of others in societies deeply polarized and traumatized by atrocities and denial, as could be witnessed in contexts as diverse as South Africa, where a truth commission was established to put an end to apartheid, to Peru, where armed conflict and repressive rule ran unchecked for two decades, and to Canada, where indigenous peoples were forcibly assimilated over decades. Public hearings are meant to provide victims a public platform through which their suffering, often denied and unrecognized, will be heard and acknowledged by the commission itself and by the society at large. Sometimes they are also used as a vehicle to make public the testimony of special experts and important political figures. These effects can be multiple and reinforcing. Victims derive satisfaction from asserting their dignity in a public forum. Commissions strengthen their public legitimacy in an often polarized public. Sectors of society that were numb to the pain of victims may find within them a renewed sense of solidarity, bringing with it a willingness to discuss a denied past. Through public hearings, the public has an opportunity to see for themselves how the commission operates. In doing so, the commission’s work leaves the impersonal arena of political agendas and polarized media coverage and enters the intimacy of people’s homes, shrinking the space for denial and opening up the country to face its difficult truths. Public hearings were not a regular feature of early truth commissions, which started in Latin America in the 1980’s. There were often good reasons for this: confidentiality provided fertile ground for perpetrators to come forward in some cases, and in others fears of retribution outweighed the benefits of the public eye. However, the decision of South Africa’s Truth and Reconciliation Commission (TRC) to host a series of public events across the country marked a turning point in the international perception of open hearings. Between April 1996 and June 1997, the TRC held 83 hearings in public places likes town halls, schools, and churches, with victims and perpetrators alike being given a chance to speak. In all, nearly 2,000 victims testified, their stories reaching thousands through special broadcasts on the country’s main television and radio channels reaching almost all South Africans. Some observers maintain that in South Africa, public hearings were also seen as a nation-building tool, communicating a shared societal intent to reach out to fellow South Africans, perpetrators as well as victims, in order to establish a united future. Similar assessments accompanied the hearings before the truth commissions in several other African countries, Morocco and Peru. In Peru, the conflict between the government and leftist rebels from 1980 until 2000 ravaged rural populations, whose suffering was never properly reported – let alone acknowledged – by state officials or the urban centers of political and media power. Through the eight public hearings broadcast in 2002, the TRC told the story of these abuses not as relevant only to those living in the affected regions, but to all Peruvians. These hearings rendered victims’ stories impossible to ignore and difficult to deny, even to those intent on doing so. In Canada, the country’s Truth and Reconciliation Commission sought to grapple with the forced assimilation of indigenous people, specifically the Indian Residential School (IRS) system. The system’s aim: “Kill the Indian in the child.” More than 150,000 children were taken from their families and communities and placed in the IRS system. While there, they were prohibited from speaking their native languages or practicing their cultural traditions and were often subject to physical, sexual, and emotional abuse. The policy devastated indigenous communities inflicting direct and trans-generational trauma on survivors and their families, resulting in some of the highest numbers of suicide, alcoholism and family violence in the world. Because of the intensively cultural nature of the violations it addressed, the TRC’s public hearings foregrounded indigenous traditions and artistic expressions. Public hearings were conceived as national events where victims publicly testified about the abuses they suffered and had opportunity to directly engage representatives of the state and churches that implemented the policy. More than this, these events were designed as celebrations of indigenous identity that was targeted for extermination and invited all Canadians to celebrate this cultural heritage through ceremonies, musical performances, poetry, films and other artistic interpretations. Beyond these seven national events, which took place between June 2010 and March 2014, the TRC held a series of regional events and community hearings, where victims had the opportunity to testify publicly in the form of Sharing Panels and Sharing Circles. “At one of the very first hearings we held, a very prominent and accomplished Indigenous leader summarized his statement to the Commission with these words: ‘I want my identity back…Is that too much to ask?’” said Marie Wilson, TRC Commissioner. “And everywhere we have gone, from coast to coast to coast, at least half the Survivors who speak say that it is precisely this reconnecting with their culture and identity that has been the key to their own healing, the key, as they so often put it, to “finding their way home”. In Tunisia, the earthquake of public hearings rumbles on: they are set to continue in the coming months, with a special session scheduled to coincide with the International Day for the Right to the Truth on March 24th. As tens of thousands across Tunisia and the world tune in once more to hear victims share their stories before the TDC, we have a unique opportunity to explore public hearings’ impact in real time. ICTJ Director of Communications Refik Hodzic sat down with two women whose work has been critical to the success of the commission – Abdellatif of the TDC and Salwa El Gantri, ICTJ’s Head of Office in Tunisia – to discuss what they have taken away from the process so far.